In the past two decades of global climate awakening–as the world ‘negotiated’ and ‘renegotiated’ climate deals–one man took upon himself to rendezvous the world with the ‘Inconvenient Truth’. The man needs no introduction to climate activists around the planet and little, if any, introduction to the global political class. Albert Arnold Gore, Jr. (popularly known as Al Gore) former Vice President of the United States and currently an author, businessman, and environmental activist has been spearheading a global campaign of educating citizens about global warming largely through the documentary titled ‘An Inconvenient Truth‘ (2006). Gore did not restrict himself to the US alone but went across the world to create a global force consisting of specially trained climate activists who are dedicated to educating people about the urgency and solvability of the climate crisis. 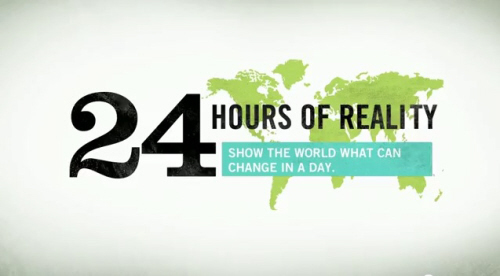 Today, on September 15th 2011, all of you can join in for 24 Hours of Reality, led by Al Gore whose multimedia presentation will be delivered in 24 locations around the world. 24 Hours of Reality will be a live broadcasted event that will reveal the reality of climate change. The event will take place in Delhi at Paharpur Business Centre & Software Technology Incubator Park (PBC), 21, Nehru Place Greens, New Delhi – 110019. Readers can join in the 24 hours of reality through the live streaming that will take place at the Climate Reality website here. The Delhi chapter’s presentation will begin at 6.30 pm today. The Climate Project (now Climate Reality)t is bringing the facts about the climate crisis into the mainstream and is working to engage the public in conversation about how to solve it. The underlying objective of the Climate Reality project is to sensitize citizens around the world and help the to discover the truth and take meaningful steps to bring about change. The Climate Reality Project has more than 5 million members and supporters worldwide. It is guided by one simple truth: The climate crisis is real and we know how to solve it. The Climate crisis may have been a result of the over-development of the western world. But its impact are going to be felt by one and all across the planet. The situation is such that relatively poor and under-developed countries are fighting for their survival today. Only a global economy based on sound principles of sustainable development and inclusive growth can ensure equity and climate justice. Attended the event Yesterday.The new slides are add on to the already disastrous situation we are in.Please don’t remain mum,speak up and take action.School and colleges can be the first point of reference to spread awareness as they are the future of tomorrow.On a personal note,let me know if you wish to have a session on ‘The India’s climate change story’ at your school,college,office or community.